*Ron Artest has absolutely no regrets about giving away his Los Angeles Lakers championship ring to boost mental health awareness. In fact, it just encourages him to go out and get another ring. According to the Associated Press, Artest announced the winner of the charity raffle for his ring late Saturday night at a club across the street from Staples Center, where the Lakers were trounced by the Miami Heat 96-80 in the NBA’s Christmas showcase. Artest came up with the idea to give away his first NBA title ring after putting a spotlight on mental health by thanking his psychiatrist after Game 7 of the Lakers’ triumph over Boston last June. While some laughed at another stunt by one of the NBA’s biggest characters, Artest’s candid declaration sparked an interest in normalizing mental health care, which snowballed into this unique charitable gift. And when he officially gives away the ring in a couple of weeks, Artest feels he’ll be even more motivated to replace it with the Lakers, who are chasing their third consecutive title. Although he doesn’t yet know the final figures, Artest’s raffle has raised well over $500,000 for his Xcel University charity, which will work with high-risk youth on mental health issues. Artest said he already wrote his first $50,000 check from the proceeds to the charity. Artest sounds overwhelmed by the support, praising everyone from his teammates to the Lakers’ fan base for participating in the raffle. Even Lakers coach Phil Jackson says he bought a few tickets, praising Artest’s strategy to funnel the money directly into a charity rather than through intermediaries. The Lakers’ rings from the franchise’s 16th championship contain a piece of the ball used in Game 7 against the Boston Celtics. The ring also has a circumference of 16 oversized white diamonds representing the Lakers’ titles, along with two championship trophies made of 16-karat gold. On one side of the ring is a three-dimensional likeness of the player receiving it. Artest hasn’t satisfied his taste for unorthodox gestures of charity: He also recently said he would like to donate a huge chunk of his $6.79 million salary for next season to mental health charities. That desire might be a bit tougher to fulfill in today’s economy, however. Artest said Saturday that his only Christmas wish was for “a tax break directly from Obama” because of the high cost of his lifestyle with his wife and children. 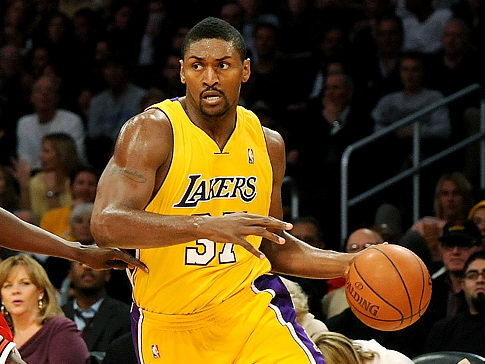 “Unfortunately, diamonds are a girl’s best friend,” Artest said. God Bless him! Lord knows mental health issues is a issuse in the african american commuity.